The 1826 Capped Head Quarter Eagle is the rarest date in the series. Following the issuance of the 1808 Quarter Eagle, there were no more coins of the $2.50 denomination until 1821, when the Capped Head style debuted. The Capped Head Quarter Eagles ran until 1834. By far the rarest of the series is the 1826. Mint records indicate only 760 pieces were coined that year, though numismatic scholars think a fair number of them were actually minted in 1827, still bearing the 1826 date. While there may be some uncertainty as to the original mintage, no one denies their extreme scarcity today. Fewer than two dozen have survived the rigors of time. All 1826 Quarter Eagles are 6/5 overdates. On the seldom occasion when an 1826 Capped Head Quarter Eagle goes onto the marketplace, deep-pocketed collectors try to elbow past one another to become the next proud owner. We can expect the 1826 Quarter Eagle to be a headline coin for generations to come. The 1826 Capped Bust Quarter Eagle is one of the key date gold coins in United States numismatics. 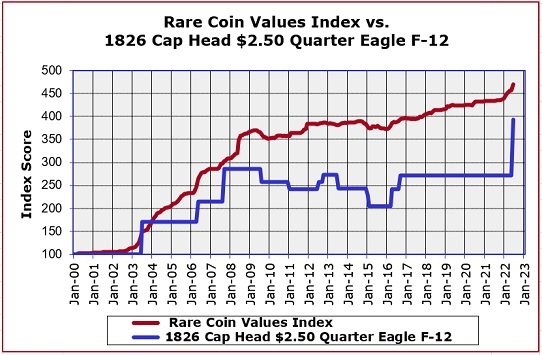 The blue line above charts the percent value increase of the 1826 Quarter Eagle since Year 2000. The red line, also starting with a baseline of Year 2000, is the percent increase of the Rare Coin Values Index, which represents the performance of the US rare coin market overall. The Index is comprised of 87 rare coins across the range of United States regular issue numismatics. The 1826 Quarter Eagle is one of the 87 coins followed in the Index. As you can observe on the chart above, the 1826 slightly underperforms the Index, but nonetheless, has a fine track record of value growth. All Index data is updated monthly.